RALEIGH COUNTY, West Virginia (CNN) -- Lorelei Scarboro loves to talk about the wild turkeys and bears living on West Virginia's Coal River Mountain. About 470 mountaintops in Appalachia, including the one next to Coal River Mountain, have been destroyed. She watches them from the home her husband built when they were first married. But Scarboro is convinced it could all become a casualty of blasting that could begin on the mountaintop that is just 100 yards from the family cemetery where her husband is buried. "Everything I have here is at risk," said Scarboro, whose father, grandfather and husband all worked as coal miners. "I know there is a right way and a wrong way to mine coal, and mountaintop removal is the most destructive practice they can do," said Scarboro, now a member of the Coal River Mountain Watch. Mountaintop mining is legal and became more prevalent six years ago, when federal laws were relaxed. 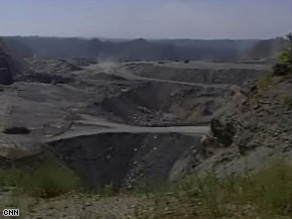 During the mining process, miners blast the mountain and shear off the top ridges to extract layers of coal. From the air, the affected mountains appear flat, gray and dusty, with rubble sliding down into the valleys and streams. Officials in the mining industry point out that after mountaintops are mined, they plant grass, trees and other vegetation, a process known as "reclamation." But critics argue that it takes decades to replace the woodsy ecosystems that have been destroyed. Massey Energy, a coal company, supplied CNN with environmental reports and the permits it received from the West Virginia Department of Environmental Protection. "The owner has a right to their property, and as long as they extract the mineral in compliance with the law as it's written today, then they have the right to do so," said Randy Huffman of the state's DEP. "There are only certain things that allow me to deny a permit. And you know, what's morally right or wrong in mine or someone else's opinion is not one of those things." Community activists from Coal River Mountain Watch believe that there is an alternative: Mine coal underground and build a wind farm on the highest ridge, which they estimate could power 150,000 homes. "Wind is viable in this area now," said Bill Price, who grew up in the area and is now an environmental activist with the Sierra Club. Massey Energy disagrees and cites studies saying other mountains would provide more wind. The company says supporters of the wind project should apply for the necessary permits and says its own engineers are looking into the feasibility of placing wind turbines on the mountains where the coal has been removed. But Price and other environmentalists, including Rory McIlmoil of Coal River Mountain Watch, said that when the mountain is lowered, it impacts the speed of the wind. "Every time Massey Energy sets up a blast, a wind farm loses megawatts," said McIlmoil. He has asked Democratic West Virginia Gov. Joe Manchin to halt mining and give the group a chance to prove that wind energy can work. But Lara Ramsberg, the governor's spokeswoman, says that until the data are available, now isn't the time to stop mining. "The governor sincerely believes, as a country, we can't take anything off the table," Ramsberg said. As the mining continues and the battle wages on over mountaintop mining versus wind power, many of the residents who live in the coal mining community worry about the loss of jobs and devastation to their neighborhoods. Gary Anderson and his wife grew up in the Rock Creek area and retired there several years ago. As they sit in their backyard with friends who come from proud families of coal miners, they talk about the blasting and agree that it could destroy their homes and hollers. "Look at that mountain. Who gives them the right to come in and blow it away?" Anderson asked, choked up with anger as he pointed to the mountain. "They once made a comment they would restore [it] as good as or better than they found them, but can you improve on God's work?" asked former miner Bob Brown. Though Lorelei Scarboro knows that she might not be able to save Coal River Mountain, she won't give up without a fight. "We don't live where they mine coal," Scarboro said. "They mine coal where we live."